The gladiator in him couldn’t allow Jim Thome to fully enjoy his 548th home run (that moved him into a tie for 13th place on the all-time home run list with Hall-of-Famer Mike Schmidt), because the White Sox lost the May 19th game to Toronto. "It's nice to accomplish this but not fun to come home after getting swept," Thome said after the Chicago south siders’ disappointing road trip. "It's always nice to tie somebody that had a great career, and again it's an honor to be in the same club (500 HRC) as Mike Schmidt, but you would like to do it in a win," He said. 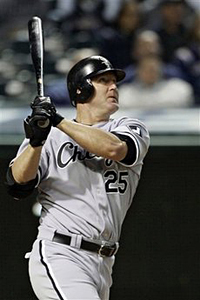 Both Schmidt and Thome began their careers as third baseman, but Schmidt combined his power with great defense and stayed at the position throughout his career…while “Big Jim” has served as an intimidating force on the White Sox team that won in all in 2005. Six days later, the 5-time All Star was definitely in a mood to celebrate (but still wouldn’t gloat) when he led the “Sox Power Surge” that resulted in a 17-3 rout of the Los Angeles Angels with several hits including a three-run home run (#549), which eclipsed his one-time teammate Schmidt on the all-time leader list. 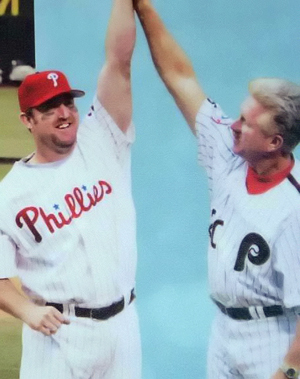 Jim Thome still has the photograph of Mike Schmidt grabbing his hand and raising it aloft as the two of them stood at home plate at Philadelphia's Veterans Stadium when the Phillies played their final game there in 2003. The two sluggers will always be linked because of that moment, which Schmidt viewed as a symbolic passing of the torch. Thome is moving up on Alex Rodriguez, who is a moving target with 560, and both are pursuing “Mr. October” Reggie Jackson (563), Rafael Palmeiro (569) and Harmon Killebrew (573) who are within their reach this season. Editor’s Note: Thome and Schmidt both hit 30 or more home runs in nine consecutive seasons, but Jim Thome's streak is still alive.